The Russian Progress MS-02 spacecraft launched successfully today beginning a two day journey to dock with the International Space Station. Roscosmos elected to do the two day journey to allow time to fully test all the upgraded systems on the newer MS version of the vehicle. The first Soyuz MS crewed mission is due to launch in June and validation of the systems is required before that can occur. This is the second of three cargo vehicles scheduled to travel to the station in less than a month. The first one year mission on the International Space Station begun this afternoon with the launch of the Soyuz TMA-16M spacecraft from the Baikonur Cosmodrome. Following a smooth countdown the three crew members Gennady Padalka, Mikhail Korniyenko of the Russia Federal Space Agency and Scott Kelly of NASA lifted off at 3:42 p.m. EDT. Once in orbit the spacecraft deployed its solar arrays and antennas before performed the first of several burns to take it to the space station later today. 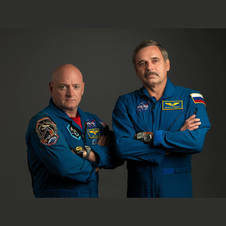 Unlike previous missions to the ISS Mikhail Korniyenko and Scott Kelly will not be returning to Earth aboard the TMA-16M vehicle but will instead spend a year on board the station and eventually return in March 2016 aboard the TMA-18M vehicle. During their time aboard the station the crew members will be subject to a number of tests to determine the long-term effects of working in space and while this has been done before aboard the MIR space station it is the first time aboard the ISS. However the experiments are not limited just to the two in space, Scott’s identical twin brother Mark Kelly a former NASA Astronaut will also be under going tests during the same time period. This will allow NASA a unique opportunity to study the differences between being on Earth and on ISS. While a lot of focus for this mission has been on Korniyenko and Kelly, we shouldn’t forget that Padalka will be setting a record while on orbit, the most time ever spent in space. The record of 803d 9h 39m, which is currently held by Russian Sergei Krikalev, will be passed by Padalka on 5th July this year. While this isn’t the first time a human has spent a year in space, it has been 25 years since it was last done and technology has changed a lot since then allowing more in depth studies to be performed that were not possible then. Below are screen grabs of the launch, we will post a follow up article this evening after the docking and hatch opening.